The Product Familiarisation Training Course for the EFASS Internal Crane System took place at the Rubb UK HQ in Gateshead. 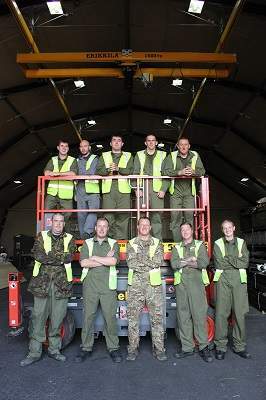 5001 Squadron is responsible for the rapid construction of Temporary Working Environment (TWE) and the installation of Portable Aircraft Arrestor Gear (PAAG). TWE provides environmentally controlled facilities, including Rubb military structures, for fast-jet or rotary assets and has been supporting deployed exercises and operations in the Middle East, Europe and the Falkland Islands. The aim of the course was to familiarise participants with the various tasks and activities required for the installation, pre-testing, setting and maintenance procedures associated with the EFASS internal crane system. The course involved both classroom and hands-on training. Ten squadron members reviewed relevant installation and maintenance documentation, along with practical demonstration and assessments involving the attendees carrying out the various tasks on the working example within Rubb’s military refurbishment building. The course was split into two parts: the installation of the required elements to fit the crane system into the Rubb EFASS hangar and then the installation and maintenance of the actual crane system. The crane training was led by a Specialist Crane Engineer James Quinton, of Quinton Maintenance Services. Meanwhile, the installation of the supporting elements was led by the Rubb Training Team. The dismantle and refit of the installed working crane system was demonstrated by Rubb H&S / Quality Manager Stephen Jackson via review of documentation and drawings, along with demonstration on practical examples at ground level, using a separate crane system. This proved to be more practical due to attendance numbers, as all were able to participate and not just observe from the ground. The remaining practical elements of setting up the crane system, the maintenance tasks, fault finding and inspections were all performed on the working example, with groups of two to three people accessing the crane at high level in turn, under direct supervision of the crane engineer (trainer). This was followed by a short inspection and Q&A assessment to complete the practical. To further validate the training and to provide feedback for future improvements to the course all the attendees completed a Product Familiarisation Feedback Form. All participants reached the required level of competency, and certificates were issued by the Crane Engineer. 5001 personnel regularly attend training sessions at Rubb Buildings’ Gateshead factory on all aspects of installing Rubb Military buildings and accessories at bases and in theatre.